6 Bedroom/5 Bath House - Steps to Beach - Walk to Everything! NOW RENTING FOR 2019. Ask about our SPRING and FALL weeks! THANK YOU TO OUR 2018 GUESTS! Located at 19 Avocet Street, North Forest Beach. COMPLETELY RENOVATED - THE HOUSE LOOKS BEAUTIFUL!!! There are ocean peeks from several rooms! We had a great season in 2018 and everyone really enjoyed this home! We are excited to provide a wonderful vacation season for our 2019 guests, both returning and new! Hilton Head has several new restaurants, ask about them! This home has been renovated and expanded to a 6 Bedroom, 5 Bathroom home with two separate living areas, wet bar, big-screen TV (surround sound DVD and VCR), tiki hut by pool with grill, refrigerator and sink, granite kitchen and more! New Furnishings are throughout! Wireless internet is included! This renovated and decorated, third row home features a fenced in backyard with a private pool/jacuzzi with tiki hut (has fridge, sink and grill). (Pool heat is available at an additional charge.) The large open great room is enhanced by hardwood floors and a vaulted ceiling. Just steps to the beach and Coligny Plaza, this home is a great spot for a family vacation. There are two master suites in two separate wings of the home, each with king beds. The four guest rooms have a combination of queen and twin beds. Sleeper sofas add additional sleeping spaces. ** Pool heat available at an additional fee. Within walking distance is the beach (less than 300 feet) and Coligny Plaza (200 feet). It wouldn't be vacation without Coligny. This shopping plaza is strategically located with 60 outstanding stores, restaurants, and services at the center of Hilton Head island. Sample something tasty at close to 20 unique restaurants and food purveyors. Catch a live performance on Center Stage. Feed the ducks at the famous Duck Pond. And take home a memory... or two. There is no other location on Hilton Head Island that offers the amenities of the ocean and shopping all within a really short distance from your home. Come and see. Hilton Head Island is a generational vacation destination that also has an amazing permanent resident population. TRAVEL + LEISURE has named Hilton Head Island #1 in its list of The Top 10 Islands in the Continental US. There is something for everyone. Nature buffs can view loggerhead sea turtles, abundant bird life and the dolphins who call Hilton Head Island home. Sports enthusiasts long for the golf courses, tennis and outdoor activities offered on the island. Beach lovers dream of the wide, flat, and long beaches, perfect for a walk/run/ride or day of swimming and enjoying. All the activities can be reached by bicycle. Whether you stay for a few days, a week, or a month, the island has something for everyone both on and off the beach. Bed configuration: Two Kings, two Queens, 6 Twins (2 in one room and 4 in another with two as bunks) and two Queen sleeper sofas. Our families have been living and vacationing on Hilton Head since 1998! It is a beautiful paradise awaiting your arrival to make memories and fun! Come relax, take in the beach air and spend quality time that you will cherish for years to come. 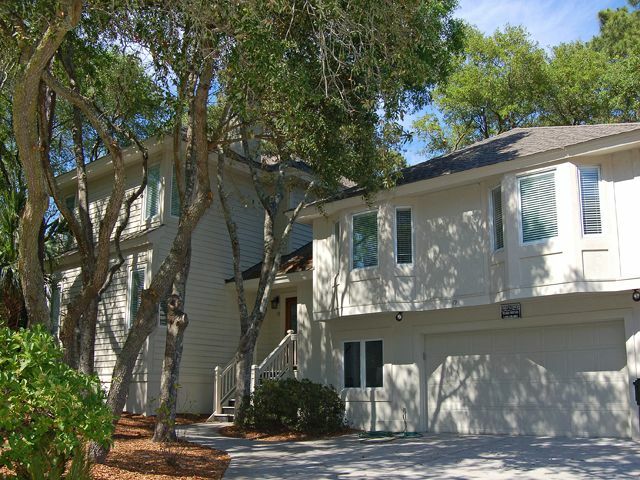 This property is ideally located close to the beach, shopping and everything Hilton Head. Location is everything and this one has it all. When we purchased it in the year 2000, there were only three bedrooms and 2 bathrooms. We saw the potential, so we doubled the size of the home. We have been so happy with the progress the island has made while keeping its unique charm alive and well. You will enjoy the dual living areas and split floor plan design. There are three bedrooms on each of two wings making this home ideal for two or more family units to be together, while having some privacy also. The large back deck, pool, hot tub and tiki hut make for perfect entertaining. Bath and hand towels, but not beach towels. This home has stairs to every entrance. Hot tub integrated. Heat option heats both.